Perennial Flowers. The Foundation Of Every Great Garden. Perennial Flowers. The Ones We Can Rely On Year After Year After Year. 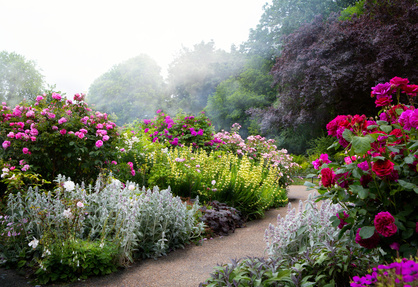 Morning Mist in the Perfect Perennial Flower Garden. Perennial Flowers are those which take one or two years to produce their first flowers, and then they keep flowering every season after that for several or many years. They just keep on going. Some kinds may live up to 30 years or more. However, there are many perennials which will flower within a year and every year from then on. If you are not sure of the flowering times just look on the plant tags. All the perennials on this page can easily be grown in Australia. Just as we can divide flowering plants into Monocots and Dicots - which is handy if you are studying, or for identification purposes - classifying flowering plants (Angiosperms) according to their flowering cycles (or growing seasons) is useful for gardeners because it lets them know what is about to flower and when, or do some other amazing thing like produce fruit. Iris Flowers are Perennial plants. These may be either rhizomes or bulbs, showing up with all the other annuals in spring, but they are actually perennial plants growing for a few years to many years. Any plants with underground storage storage systems such as bulbs are perennials. Scroll down for a List of Perennial Flowers which are easy to grow, and don't forget to check out the List of Perennial Flowers from A to Z. There are four groups of Perennial plants: Herbaceous, Woody, Deciduous and Evergreen. Scroll down to see them. On this page the main types are the Herbaceous Perennials. The other types of flowering plants besides the perennials are the annuals, the biennials, and the ephemerals. The annuals complete their cycle from seed to flower in just one season. Then the whole plant dies leaving only the seeds behind in the soil (or on the plant itself) to grow new plants or to be gathered by eager gardeners. Biennials such as Foxgloves and Hollyhocks (we just call them annuals) and even onions complete their whole cycle in two years. They produce their roots, stems and leaves in the first year, then in the second year they produce their flowers. Then they die completely. They are very easily confused with perennials because 'bi' means two, but these flowers don't continue to flower past their allotted two years. Other Biennial plants are Queen Anne's Lace (which is actually a wild carrot), Canterbury Bells, Sweet William, some kinds of Evening Primroses, and Lunaria. The Forget Me Not Flower has to be one of the most outstanding little garden gems. It comes in Biennial, Perennial and even Annual forms nowadays. The sweet Lunaria or Honesty is a Biennial. So we must keep re-planting the annuals or rely on their seeds to spring up annually. Fortunately, most of them keep self seeding so we can treat them as perennials and enjoy them each year. I know for certain that Forget Me Nots always come up each year without any help at all. In the first season, the Biennals produce their roots, stems and leaves and in the second season they produce their flowers and seeds. Then they, too, die back. So, as with the annuals, we need start all over again. But then you can hope that they self-seed in the right place or you can move the seedlings around and put them where you want them. Plants with underground food storage can survive without problems through the harshest winter, making them true perennials. Find out about the different types of bulbs and others on the Spring Bulbs page. The Ephemerals are short-lived plants which take advantage of the right conditions eg. enough rainfall or sunlight, to bloom with a vengeance because they don't know when their next chance will come again. 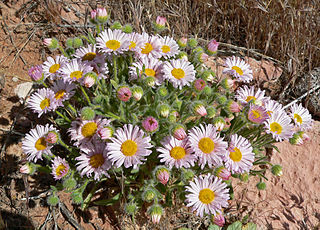 Desert plants and wildflowers are good examples, although others are scattered all over the world in many locations. The Perennial Flowers. They Just Keep Coming Back. Peonies, like the 'Hesperus', produce gorgeous rose-like blooms and are perennials. Although they look like roses, and are often called peony roses, they are not roses. They belong to the Paeoniaceae family. Perennials really are the mainstay of any garden and may take a bit more planning as to where you want to show them off because they're virtually here to stay. They offer season after season of beautiful blooms, even if, to them, the blooms are simply there for one reason - to attract pollinators and so complete their need to reproduce. A word of caution: exercise a bit of restraint here! These plants don't just go away so that we get a whole new lot next season like the annuals. Perennial plants are here to stay. Perennials will need to be carefully selected or you could end up with 'beginner's bad luck' - at the most you'll have a stuffed garden and at worst you'll be broke. This comes from me after several experiments. It's best to start with just a few and fill up the spaces with annuals, rather than spending quite a lot of money on 'the ones you just have to have' - especially if you've been looking through catalogues all winter. The beautiful blue and white Agapanthus is a perennial which looks beautiful in just about any kind of garden. It comes in three sizes and is a good choice for spring through to autumn blooms. And the delicate Iris Flowers also add beauty to any perennial garden. The reliable and hardy Evolvulus. What you need are Perennial plants which are fairly tough, don't require a lot of water, only need average soil, and can tolerate a bit of 'ignorance' ie. neglect, on the part of us, the gardeners, whose job it is to keep our plants happy. If you want perennials for your rock garden or for a hot spot or even a hanging basket, and which will also give you lots and lots of flowers every year with little maintenance, you might like to try Portulacas. Often called Moss Roses, they are definitely not a rose. And they spread! And speaking of Portulacas, if you can get hold of the plant in the picture above - the Evolvulus - it makes an excellent perennial plant which flowers for most of the year. I grew these two together - Portulacas creeping out from in between the dense mats of Evolvulus in a border rock garden in thick clay soil in SE Qld. Neither minded the tough conditions and survived many years together with very little care. Ground cover you can count on. Evolvulus glomeratus. Well I didn't know back then that they came in other colours. Wow! Perennial flowers can be grown singly or in groups (but always plant them in threes or fives otherwise they can end up looking a bit like a row of vegetables). It just looks better to have flowers in odd numbers. Annuals and biennials can then be used to fill in any gaps and complement the perennial flowers. The Moonflower. This is definitely the one I had. Ipomoea alba. The Moonflower is the only plant which brings tears to my eyes even thinking about it, because it is so beautiful. It flowers for most of the year, its perfume is out of this world and you can just sit and watch each flower opening. This takes less than half an hour and it is time very well spent. It's a climber and will completely surround your house if you plant several. The seeds are very large and easy to collect. This hardy perennial plant will flower for most of the year in a temperate climate. You can buy these large and treasured seeds online. In the following List of Perennials, there will be some which overlap with the Annual Plants. Some types can be Annuals depending on where you live, and some are hybrids or cultivated types which are continually being developed to deliberately extend their flowering period which, after all, is what we all want. I Love The Seaside Daisy. Also Called Fleabane. Always, always, start your garden with Erigeron (Seaside Daisy or Fleabane). Even if you put it in a pot at your door. You can't kill it and it is absolutely delightful. It blooms and blooms 'as if it meant it'. For at least 5 months of the year. The Seaside Daisy is like the Fairy Rose: it always has white, pale pink and deeper pink flowers on the bush at the same time. That's its main attraction for me. Photo Credit. Dianthus barbatus. 'Sweet William'. A stunning photograph of mixed Dianthus and Pansies. Another beautiful Perennial noted for its heavenly perfume is the Oriental Lily. This is so exquisite that it is a very popular flower for Bridal Bouquets nowadays. The Pink Stargazer Lily is more highly perfumed than the white. A List of Perennial Flowers. Some Of The Most Common and Easiest Types To Grow. Find more perennials with pictures: List of Perennial Flowers A to Z. The best time to plant your perennials so that they thrive well is in Spring and Austumn, neither too hot nor too cold. Perennials planted in Summer can be devastated by heat and may just whither up and die. So choose the best spot for these stars of your garden: one where they will get good soil, compost and mulch, adequate water and the right amount of sun according to the plant tag. One Perennial which is a must have for me - sweet memories of childhood in this one - is the heavily fragrant Brunfelsia shrub. It's often called the 'Yesterday, Today and Tomorrow' plant and one look in spring or summer will tell you why. It always has flowers which are just dying (whitish for Yesterday), blooming well (dark blue for Today), and heading towards full bloom (pale blue for Tomorrow). It shares this lovely habit of three different colours at the same time with the Seaside Daisy and the Fairy Rose. A delightful habit. Ever Wondered Just How Perennial Flowers Do Survive The Winter When It's Really Cold? Perennials can survive the winter underground using the snow to actually help them cope. The plants stay snug and warm with the snow on top insulating them from the extremely cold temperatures. If you have added mulch in the autumn around your perennials, this helps them too. But the most interesting fact is that their roots have the ability to filter water into the surrounding soil so that the water in their roots does not freeze! Then when the danger of freezing to death has passed they take back their water and get ready for spring. This is why we see Crocuses and many others shooting up through the snow. They have been able, not only to survive, but to start to grow even when it's still snowing. Not only that, but they actually use the snow to keep them warm. That's clever! Even Humans use the snow to keep warm if they are lost by building a snow cave. 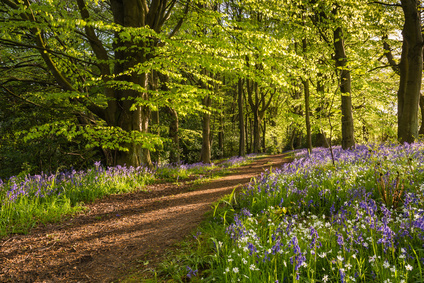 A Fleeting Glimpse Of Bluebells In Early Spring. The other group of plants labelled by their flowering cycles are the Ephemerals (meaning fast-fading). A good example of these are wildflowers which make the most of the short season when conditions are just right, such as the gorgeous display above, and desert plants also belong in this group. Desert plants are any plants which receive less than 10" of rain per year. The group a particular plant belongs do is heavily influenced by the environment, the amount of sunlight and water it gets, the temperature and just how it is going to reproduce. Getting the balance just right is an extraordinary feat which the plants, fortunately, work out for themselves. We just need to know what, when and how our plants are going to meet their need to reproduce - so we know where to put them. Buddleja alternifolia is an example of a Herbaceous Perennial flower. The Butterfly Plant. Beautiful. Bergenia cordifilia (Elephant's Ears). The Saxifragas. Herbaceous Perennial flower. Herbaceous perennial flowers are those which do not have woody stems, but are comparatively soft-stemmed, such as Cosmos, Anemones, Chrysanthemums, Carnations, Hollyhocks, Forget Me Nots and Delphiniums. These are more sensitive plants which will die back in very cold climates, but will come back in spring, retaining their roots and parts of their stems underground. They are often referred to as 'annuals' because of this, but the true annuals die underground as well. Hence, herbaceous perennials also include all the plants which have underground storage systems such as the bulbs, tubers, corms and rhizomes.The flowers on this page are mainly the Herbaceous Perennials. "Botanically speaking, annuals are plants that germinate, flower and die in one year. Of course, that puts most vegetables in the same category, but when we refer to annuals, it’s usually about flowering ornamental varieties – the ones we use to drag our gardens out of the winter doldrums and remind us that spring is really here". See this on the Annuals page. Woody perennial flowers such as roses, peonies, hibiscus, apple trees and hydrangeas have tough woody stems and branches which do not die off in the cold. They may lose their leaves, but they retain the basic above ground structures. The Beautiful Deciduous Deep Pink Crepe (Crape) Myrtle. Deciduous perennials lose their leaves but retain their above ground parts. A wonderful example of a Deciduous Perennial is the Crape (Crepe) Myrtle. 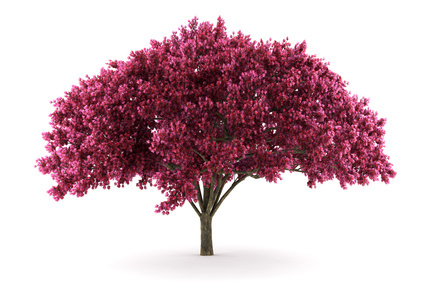 This is one of the world's most loved trees because it has flowers in spring to summer with lovely green foliage, then it has stunning autumn colours of reds and yellows. Even its bark is pretty. The flowers are divine and it was one of my favourite trees that I grew up with. We had a pink and a purple, but I just loved the pink. It grows from 18 to 25 feet tall. It only takes a few years to really get going. Evergreen perennials retain all their foliage during the winter. However, just when you think you've got it all covered, there's another way of classifying our garden plants The Monocarps, Polycarps and even the Paucicarps. Monocarps only flower once before they die, but they may live for many years before they do this. Polycarps flower time after time and Paucicarps flower only up to five times before they die. Most of us don't need to bother with this type of plant classification (unless you've got an Agave - a Monocarp), but it shows that for Botanists, the sky's the limit in classifying plants. The following article goes into these types of plants in detail: Life Spans of Plants. Perennials however, are definitely Polycarps. Home. Return from Perennial Flowers to Annual Plants. "A garden is a thing of beauty, and a job forever". Unknown.